Today I’m back in my favourite part of London – Covent Garden – eating out in the Seven Dials area to be specific. Seven Dials was originally laid out by Thomas Neale (who Neale Street is named after) in the early 1690s. The seven streets are designed in a series of triangles and Neale commissioned a centrepiece for his development – the Sundial Pillar (which is where the reference to dials comes from). The pillar was pulled down in 1773 but the name and concept of the area has stuck. Neale’s vision was for Seven Dials to become the most fashionable address in London. Unfortunately it did not go at all to plan with the area deteriorating into a slum which became renowned for its gin shops. There was a time that each of the seven apexes facing the monument housed a pub with their cellars all connected providing handy escape routes for the neighbourhood’s criminal element, which seems to have been substantial. It may have taken a while but I’m guessing he would be pretty thrilled with the way his creation looks in 2016. It’s all happening here with plentiful eateries, bars and designer shops – one of which is high on my list of must-visit London restaurants for anyone – Tredwell’s from Marcus Wareing. The welcome is warm as you walk into the glowing interior which has booths lining the walls downstairs (gotta love a booth). We ate in the large open space upstairs where we experienced plenty more of that warmth. The service was exceptional, with friendly, knowledgeable staff who seemed to sense our mood and gauge the pace for our dinner just perfectly. I love it when somewhere gets it absolutely spot-on right, it’s no easy matter. The menu takes some perusal and thought. Every dish reads like mix of magical ingredients and often turns up something totally unexpected. Love that. Like my starter. On the menu it says: slow cooked hen’s egg, Alsace bacon, mushroom, brioche. So I was sort of imagining a kind of egg, bacon and mushroom concoction on toast – given Marcus’s special touch of course! But no, a little bowl of creamy deliciousness arrived instead. Rich, earthy mushrooms, salty bacon chunks and a brilliant yellow yolk immersed in a light, savoury liquid. And brioche soldiers for dipping. This is bacon and egg taken to a new level, so clever and just so delicious. 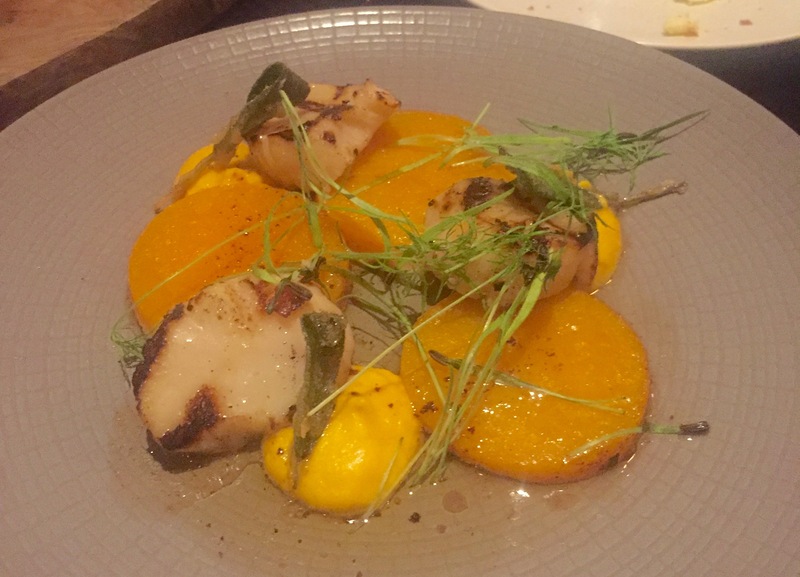 The chargrilled scallops were served with butternut squash, miso and crispy sage. An amazing combination and the sweetest of tender scallops. I rarely order chicken in restaurants, it needs to sound suitably intriguing and like nothing I’ve ever cooked myself. 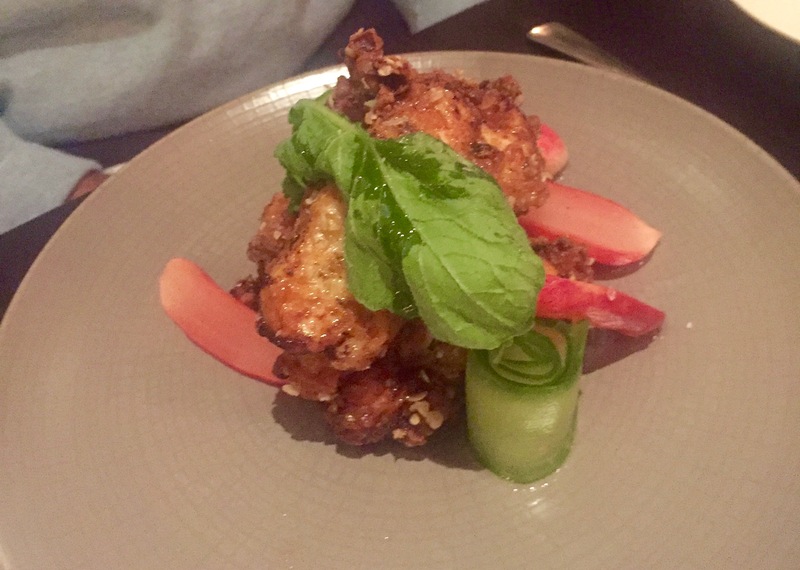 Like this crispy buttermilk chicken which was tender and crispy with flavours of bergamot and served with crunchy pickled cucumber and radish. And so on to mains. A tempting selection of meat and fish dishes makes for an almost impossible decision. 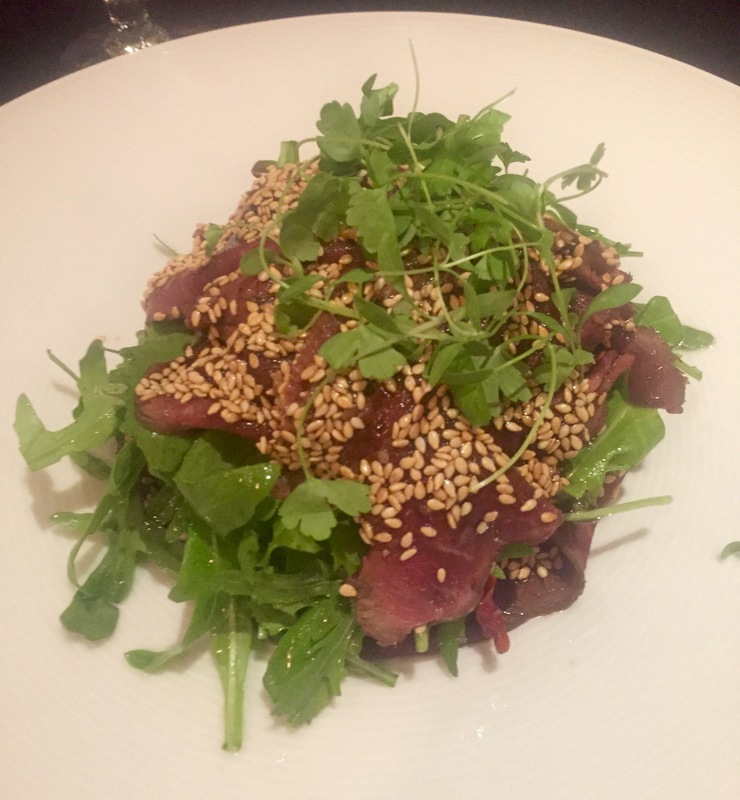 I spent so much time pondering, confused myself several times – and eventually went for the rare roast beef salad which was served with pickled mushroom, sesame and rocket. The beef was so skilfully thinly sliced, packed with flavour and generously coated with sesame seed crunch. A lovely light dish of great textures. 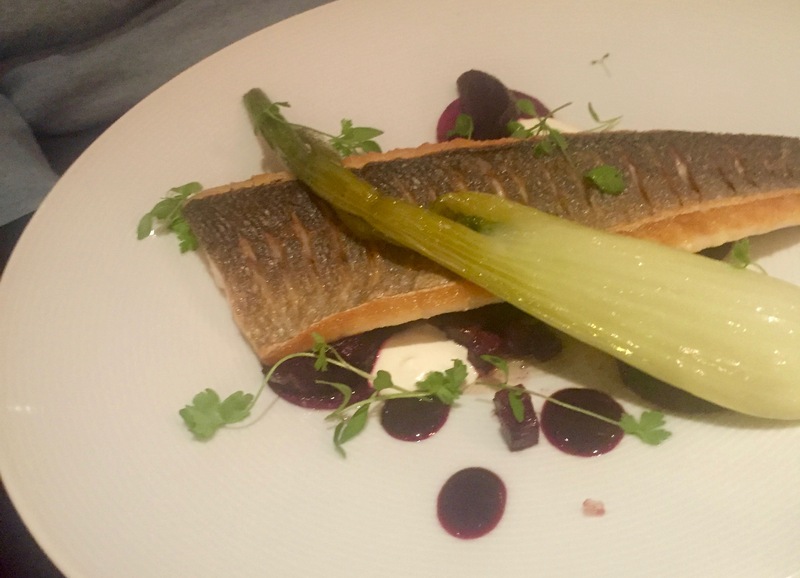 The sea bass came with beetroot, aioli, smoked creme fraiche and fennel, all stunningly displayed. 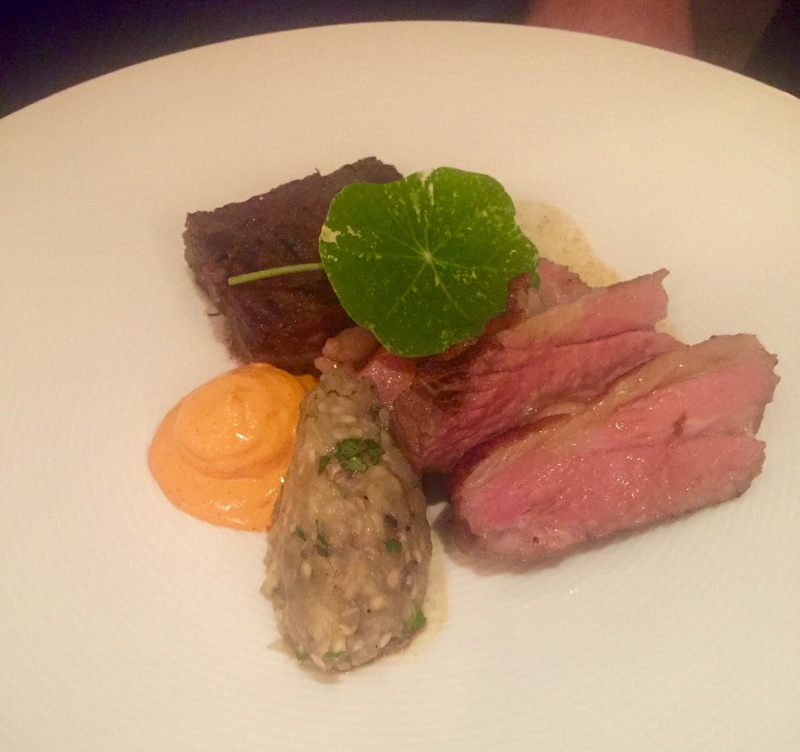 The prettiest plate of lamb was done two ways – Hardwick lamb rump and braised lamb belly and served with piquillo and sumac creme fraiche and a dollop of delicious smoked aubergine. There’s a selection of cuts of steak on the menu, including their Chateaubriand (put that down for a special celebration). 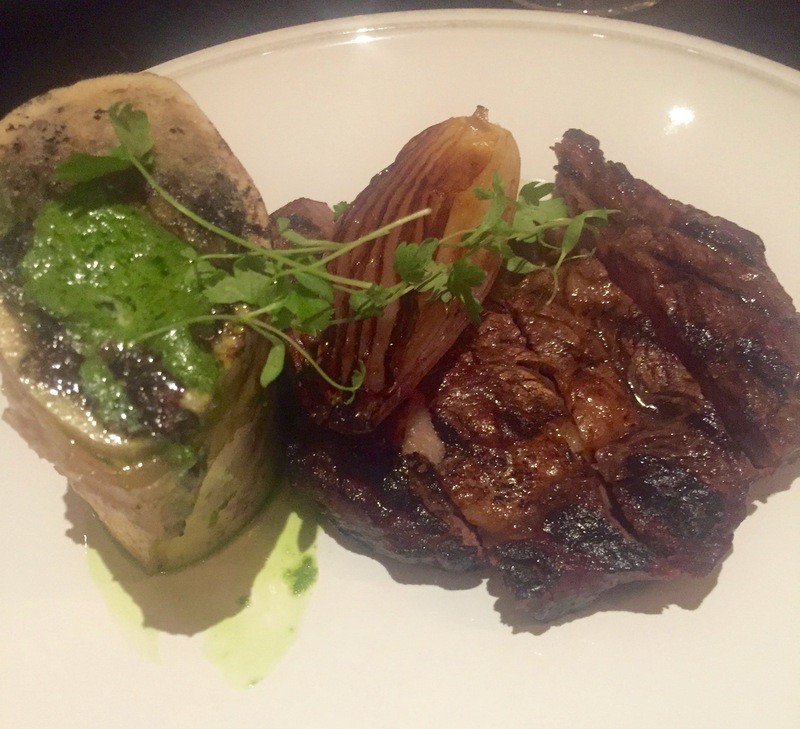 The Lake District 35-day dry aged ribeye was served with a pretty giant bone marrow, shallot and peppercorn sauce. Plates for carnivores don’t come any better than this. As well as this amazing array of food Tredwell’s also has one of the most exciting assortment of sides you’ll see on any menu. As result we ordered several. The triple cooked chips came with and absolutely sublime hollandaise mousse that I could have drunk with a straw or eaten with my fingers even. Okay, truffled macaroni cheese is a little indulgent for what is basically a vegetable course, but it was just one of those nights. 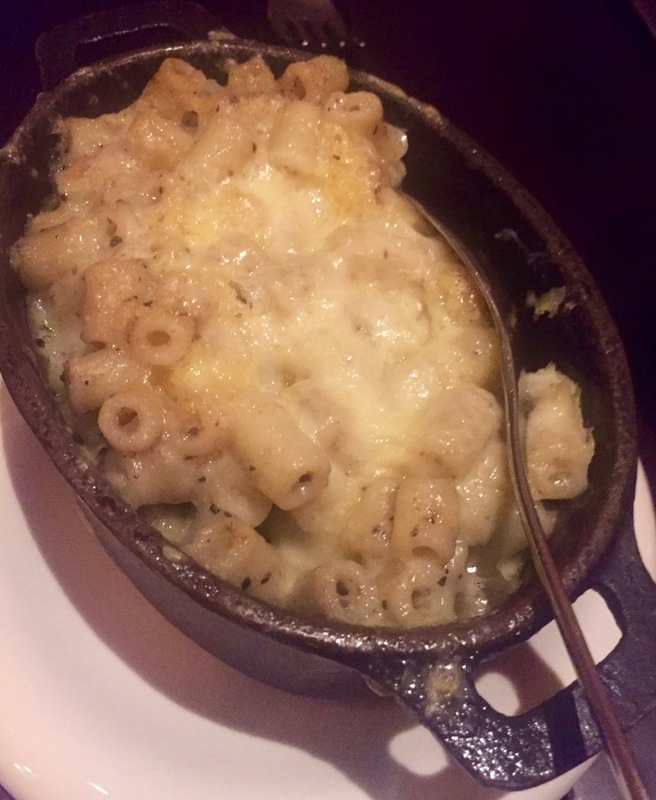 And it was perfect, light with tiny bits of macaroni and plenty of that unique truffle flavour. We really had a feast tonight which sadly meant we just couldn’t venture down the pudding page. 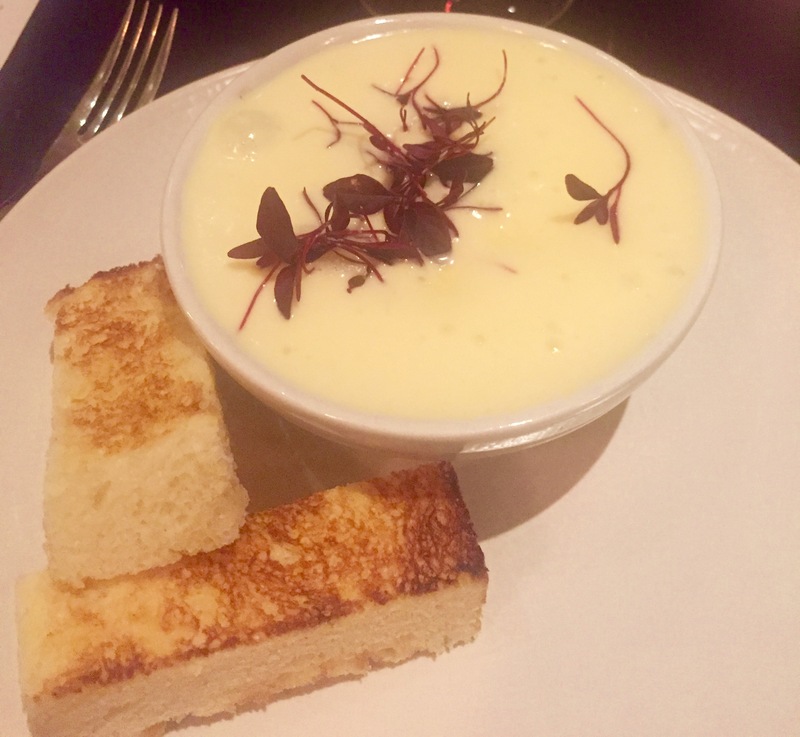 Though we did manage to retire to the lovely, cosy Tredwell’s terrace (complete with heaters and blankets) for mint teas and coffees – and a chance to inhale more of that Seven Dial’s atmosphere. Thank you Thomas Neale. Food for four people cost £145.50, which included a starter and main course each and four side dishes. We had a bottle of house red wine for £26. NB All my price points don’t include service charges. Tredwell’s is at 44 St Martin’s Lane, London WC2. It’s a very short walk from Leicester Square Underground station.